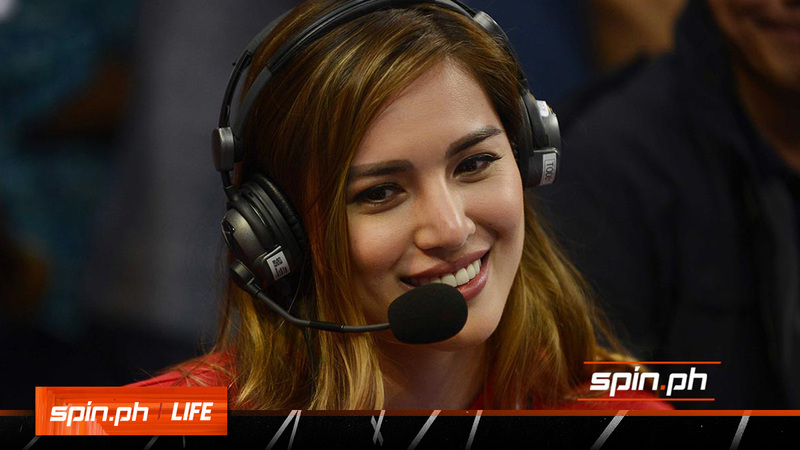 NETIZENS have been complimenting volleyball player Michele Gumabao for doing her job as an analyst in the UAAP Season 81 women’s volleyball tournament. Although she’s a newcomer in doing live commentary on TV, the former La Salle star has earned her stripes. But Gumabao, who started in the NCAA women’s volleyball tournament three years ago, was quick to say that she was just doing her job. “Ako kasi when I commentate, palagi ko lang iniisip kung anong nangyayri doon sa loob ‘yun lang ang sasabihin ko. Hindi ako humuhugot from the past, hindi ako kukukuha from before,” Gumabao told SPIN.ph. The former national team member also pointed out that when she’s on the panel doing the analysis, she automatically becomes neutral, no matter which team is playing on the court. “Pag dating ko [sa venue], once nakasuot na ‘yung microphone, I just always remember professional lang, kung ano ang nakita mo sabihin mo, maganda or hindi masyadong maganda sabihin mo lang,” she said firmly. “Kasi the people have the right to know, you have to educate them so ‘yun lang ‘yung important,” she added. When asked about her reaction on how fans shower her with good words, Gumabao’s answer was plain and simple. “Hindi ko siya masyadong pinapansin kasi alam mo naman ‘yung mga tao minsan maganda ang sasabihin nila sa’yo, minsan hindi rin ‘di ba?” she said. “So kung sinu-sino ang pupuri sa’yo, sila-sila rin ang magbabash sa’yo ‘pag may nagawa kang mali. So be thankful sa mga good comments nila but also be careful kasi you never know, you can’t please everyone,” she added. The reigning Bb. Pilipinas Globe also revealed that although she’s a proud alumnus of La Salle, she’s closer with their rival team, Ateneo. She further explained that there’s no reason for her to be biased to her alma matter because her club team Creamline used to regularly train with the current batch of the Lady Eagles, who was then mentored by Thai coach Tai Bundit, while her personal idol is with another team. “It really helps na hindi ko na sila [Lady Spikers] kilala,” said Gumabao, who graduated from the Taft-based squad five years ago. “In total honesty, mas close pa ako sa Ateneo girls kesa sa La Salle girls. Kasi sa Ateneo girls mga players lahat ni coach Tai ‘yan nakalaro ko sila eh, sa Creamline, nagte-training kami sa Ateneo so nakakasabay namin ‘to tapos ang idol ko nasa UST, si Sisi Rondina,” she added. If there’s one thing that makes her cringe is how other people compare her to her fellow analysts and commentators. Gumabao asked for everyone’s understanding when some of them might sound leaning to a particular team. “Ayaw ko lang talaga na very sensitive ‘yung pag [comments ng mga tao] kapag si Boom [Gonzales] and si Anton [Roxas] ang daming tweets na ‘wag na lang [magcompare],” she said. “Kasi mahirap din ‘yung tabaho nating lahat, you’re live, walang filter ‘to, walang delays ‘to, and ang pinakamahirap kasi is hindi naman ‘yun ‘yung ibig sabihin ng mga commentators or ng mga anchors, iba ‘yung interpretation [ng tao],” she added. “So you always have to be careful of your interpretation, iba tayong lahat ng pag-intindi, so just respect each other lang,” she continued.